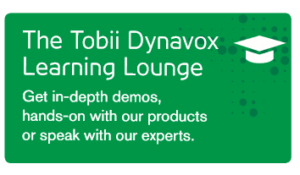 Rett U/Tobii Dynavox Live- Boston- Reading, Writing and Communication for Students with Complex Needs – Learning the Strategies and Resources that Work for All! Join us for a day focused on real-world, hands-on practice with communication skills, strategies and the academic areas of reading, writing and communication for students with complex needs. CLICK JOIN THIS EVENT BELOW TO REGISTER! TRAINING WORKSHOP- FRIDAY, APRIL 27TH WITH SUSAN NORWELL! Later in the day, we will address the academic skills of reading and writing for students with complex needs that are often thought to be impossible for individuals with Rett Syndrome and other complex disabilities. The strategies and techniques that have been developed and used with students worldwide are proven to get kids actively participating in reading and writing. Techniques for reading to and with kiddos while modeling communication will be demonstrated in videos and then put into practice during the workshop. Participants will actively use ABC and Core Word Communication Flipbooks to build a short story with a partner, focusing on understanding and improving upon the interaction needed to cultivate solid communication and educational exchanges as well as interact with high-tech options like eye gaze technology. PRIVATE ONE-TO-ONE CONSULTS WITH SUSAN NORWELL- SATURDAY, APRIL 28TH! 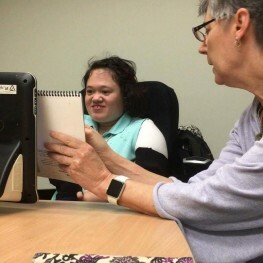 Susan Norwell has worked with a wide array of students, including those with Rett Syndrome, Autism, Cerebral Palsy and multiple disabilities for the last 40+ years. She has spent the last 30+ years in private practice working primarily with students on the autism spectrum and girls who have Rett Syndrome. She considers herself a relationship-based educational specialist and is currently focused on teaching literacy skills to students without verbal language and with significant disabilities while integrating augmentative communication and technology supports. She consults with various school districts on successful education of children with Rett Syndrome and those with complex communication needs and has presented workshops worldwide. Susan is a high energy presenter who is known for her broad knowledge base as well as practical and creative ideas for furthering the learning of those with the most significant challenges. Susan is Co-Founder of Rett University, which represents a 5-year dream of being able to provide systematic training for parents and those working with individuals with Rett. She is thrilled to see this dream actualized with Girl Power 2 Cure, Inc. and envisions people being able to more consistently unlock potential for individuals with Rett and other complex needs in the future! Seating is limited so register by clicking below!